Palliative Care: What it means. What it doesn’t mean. My son Brendan Bjorn is 12 years old. He has very complex, profound care needs, which I provide on a daily and nightly basis as a lone-parent Carer. The care level he is at is referred to as Palliative Care. In short, his condition is life-limiting and the care level he is at is no longer one of attempting to heal or cure, rather it is one of making his life as whole, comfortable, painless, and as fulfilling as it can be. Palliative Care is to be a holistic approach which also includes the family members. Palliative Care is meant to integrate the psychological and spiritual aspects of care, including grief counselling, prior to loss. Palliative Care is intended to enhance the quality of life and allow the person to live as actively and as fully as possible. Palliative Care is meant to be a team approach, to involve a support network of doctors, therapists, social workers, mental health professionals, nurses, and various social supports. Palliative Care is meant to provide the best quality of life possible for the person with the life limiting condition – and their family – while they walk on this journey together. Palliative Care status does NOT mean the person, in this case my own precious son, is to be given up on, set aside with no hope, and thus put at the bottom of waiting lists for care. Just because my son is in the Palliative Care level of his journey, it DOES NOT MEAN he isn’t worthy of LIVING LIFE TO IT’S FULLEST POTENTIAL. Nor does it mean he isn’t worthy of obtaining the special equipment that will facilitate him having that fullest life experience possible – items such as a proper ramp into the house, a safe bathing system, a reliable and safe wheelchair accessible van, and a home modified for hoist and wheelchair usage. 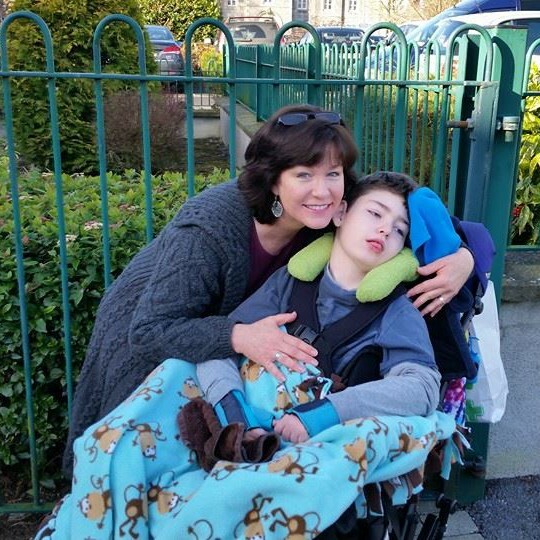 Palliative Care does NOT mean my son will die tomorrow – God forbid. Yes, he could do, and that is the hard, cold fact that I am faced with every single day. BUT HE COULD ALSO LIVE FOR 2, 3, 4 OR MORE YEARS TO COME! No one knows, no one can predict when that time will come, so in the meantime, his life should be surrounded with the gold standard ideals of what Palliative Care is all about, and to do anything less is simply inhumane. Palliative Care does NOT give license for anyone to give up caring about my son. In particular, many government policy makers who seemingly would rather ignore his many profound, complex care needs. I am often left wondering, do they secretly hope he will pass sooner rather than later to become less of a “burden on the State” or do they just not care about such sick children at all? Palliative Care does NOT mean the family’s needs should be ignored. In fact, it is written into that gold standard of what Palliative Care is to be as written by the World Health Organisation. Yet, if that aspect of proper Palliative Care is ignored, it is not just the person with the life limiting condition that will suffer, but it is the Family Carer and the family as a whole unit that will suffer, all which ultimately diminishes the level of care provided to the person who needs it most. In this case, my son, Brendan Bjorn.